Nothing fancy. No theorizing, no dramatizing. Just four jazz masters having a good time on Sunday, June 19, 2016, at The Ear Inn: Danny Tobias, cornet; Dan Block, clarinet and tenor saxophone; James Chirillo, guitar; Kelly Friesen, string bass. Without a moment’s thought of imitation, this group got closer to the spirit of the exalted Kansas City Six than any I’ve heard recently. That’s a serious thing! A few comments. First, these time-honored standards offer such luxurious room for improvisation for those who care to enjoy the freedom to roam: the old songs are far from dead when played [or sung] by vividly alive musicians. Second, the art of counterpoint or ensemble playing isn’t something that died when the last New Orleans forbear went to the cemetery: one of the great pleasures of this set is the easy playful witty conversations between instruments. And, finally, I note with great pleasure that this quartet played quiet music for listeners. And the listeners did what they were supposed to do. How nice is that? As always, I entreat my readers to find live music and savor it when possible. Marvels are all around us. We dare not take them for granted. Thank you, Swing wizards! 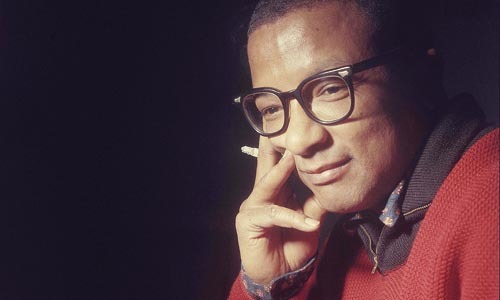 I hope that by now, in 2015, people know Billy Strayhorn as more than the composer of LUSH LIFE and of TAKE THE “A” TRAIN, more than half of a team with Duke Ellington out front. This year is Strayhorn’s centenary (his birthday is November 29) and he is receiving some well-deserved attention, although perhaps there will never be enough compensation for the limited attention he received while on this planet. 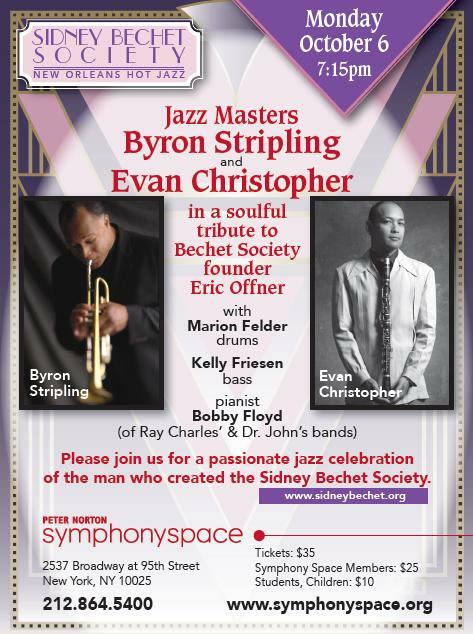 The Billy Strayhorn Orchestra will be performing a concert of Strayhorn’s music — with, as always, some surprises — on November 20, 2015, at Baruch College Performing Arts Center in New York City. The very creative and energetic saxophonist Michael Hashim leads the orchestra, which includes Kenny Washington, Mike LeDonne, Art Baron, Bill Easley, Lauren Sevian, Shawn Edmonds, Ed Pazant, David Gibson, Kelly Friesen, Joe Fiedler, Tad Shull, Marty Bound, Jordan Sandke, and Charlie Caranicas. The events page for the November 20 concert is here. Beautiful and rare music awaits those who can attend. On Thursday, November 21st, The Billy Strayhorn Orchestra, under the direction of Michael Hashim, will present a free concert at the Miller Theater, 2960 Broadway at 116th Street, at 7:30 PM. Simply RSVP to: ym189@columbia.edu and give your name and the number of tickets you need. The fifteen piece orchestra will play some rare material by Mr. Strayhorn, including the New York premiere of a major work — and fully restored versions of classics like “Raincheck” and “Chelsea Bridge” as well as some surprises. This band is so truly All-Star that I must list the full line-up below. If that isn’t enough, we will also have a presentation by the renowned author David Hajdu, Strayhorn’s biographer. And remember: we DO NOT want your money. We really, sincerely, want YOU!! All of you!! Thanks and see you there. Trombones- Art Baron, Clarence Banks, David Gibson. I can’t attend this, but I urge you to do so — it’s one of those heartfelt delights that New York offers to those who are able to savor them. I don’t have any video of this Orchestra, but here are Michael Hashim and pianist Spike Wilner performing two Strayhorn compositions: one obscure, the second famous. DAO (or more commonly TAO) is a Chinese word and concept meaning loosely “the way,” “the underlying principle.” SWING should be a more familiar word to readers of this blog. 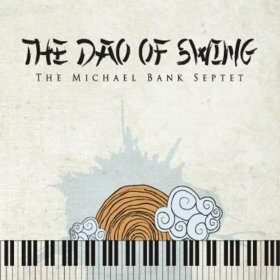 The title of Michael Bank’s new CD might be read on the surface as “The Way To Swing,” but it suggests something more profound: that happy unity when the musicians connect with the deeper rhythms of the universe. An ambitious aspiration, but Michael Bank’s Septet makes it come alive. Last year, I heard his Septet for the first time. Most of the group’s repertoire was given over to Michael’s compositions. Unlike some “originals,” in this century, they had memorable melodies and voicings. See the end of this post for three examples from that session:.I was delighted to learn that Michael and the Septet had issued a compact disc of his music. Swing, yes; imitation, no — creative evocation, yes. When heard casually from another room, the sound might suggest the rocking little band of Johnny Hodges in the early Fifties, but close listening reveals quirky, surprising touches. The Septet is rhythmically rooted in the great oceanic motion of Mainstream, but Michael’s melodic and harmonic language moves easily between Fifty-Second Street and the present, grounded in the blues and mood pieces. (His compositions are more than disguised reheatings of overplayed chord changes.) Michael’s skills as an arranger are on display through the disc — perhaps most so in his witty reinvention of WHEN IRISH EYES ARE SMILING — the Celts go uptown. Michael Bank, piano, arrangements and compositions; Simon Wettenhall, trumpet / fluegelhorn; Kris Jensen, Mike Mullens, Geof Bradfield, Ray Franks, saxophones; Kelly Friesen, string bass; Steve Little, drums. The songs are ALTAIR / AZTEC 2-STEP / FOR JAKI / MINOR CHANGES / LL3 / ONE NOTE (by Michael’s mentor, Jaki Byard) / BLUEVIEW / WHEN IRISH EYES ARE SMILING. The players are more than equal to the material: I’d known Simon Wettenhall, Kelly Friesen, and Steve Little before this, but the collective saxophonists are just splendid: everyone understands the tradition but easily moves in and out of it. To hear the music on the CD, the usual suspects: CD BABY, itunes, and The-Dao-of-Swing . Better yet, come to one of the Septet’s gigs. And one is taking place this Tuesday, September 17 — from 4 to 4:45 PM at the East River Bandshell in lower Manhattan. Michael will be joined by Simon Wettenhall, trumpet; Noah Bless, trombone; Jay Rattman, alto; Andrew Hadro, baritone; Michael Bank, piano; Matt Smith, guitar; Trifon Dimitrov, bass; Kevin Dorn, drums.